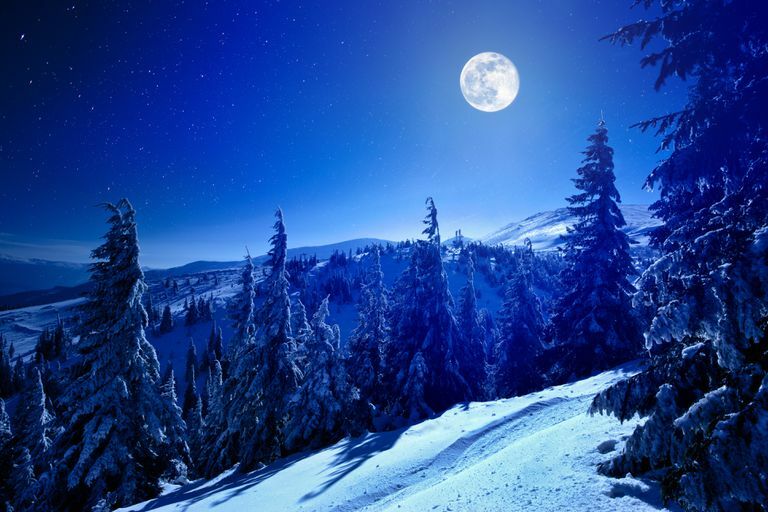 The last moon phase of the year is the Long Nights Moon in December, also called the Cold Moon or Big Winter Moon, depending on where you live. This is often a time of introspection and self discovery, as you evaluate the trials and tribulations that you've endured over the past year. However, this self analysis has a definite benefit — it gives you a chance to re-evaluate where you want to go and who you want to be in the coming twelve months. This is a season of adaptation and change. In many magical traditions, and certainly owing to its proximity to Yule and Christmas, this is also a time of sharing one's blessings with those less fortunate. As the days get shorter and Yule approaches with the longest night of the year, we force ourselves to get through the darkness, because eventually we will see the sunlight and warmth again. Think about the things in your life that you've had to endure. Sometimes, a part of us must die in order to be reborn. Now is the perfect time for spiritual alchemy — time to evaluate your life, and know that you'll survive the dark times. Get rid of that excess baggage you've been toting around. If you've already put the darkness behind you, take your good fortune and share it with others. When it's cold outside, open your heart and home to friends and family. Reach out to people who might be suffering from the chill of winter, either spiritually or physically. Because this is, for many of us, a fallow time of year, often the magic of December focuses on self-discovery and change. As we evaluate who and what we have become — and wish to be — we allow ourselves to share our blessings with those around us, and spread our good fortune and well wishes. Take some time to examine the relationships you've had in your life over the past year — and not just romantic ones. Are you doing everything in your power to maintain healthy, happy connections? If not, what can you do differently? If there's something you need to let go of — something that's been dragging you down for the past year — now's the chance to release your baggage. Write your problem on a piece of paper, sit outside under the full moon, and burn the paper, scattering the ashes into the breeze. Alternatively, tear it up and throw it into a moving body of water. Either way, once it's gone, you can start thinking about how to move forward with your life. Set up and outdoor altar with seasonal items like holly branches and pine cones, and burn some cinnamon or winter solstice incense. Go outdoors at night with a bowl or cauldron full of water, and do some moonlight scrying. This is particularly helpful if you know you need to make some changes, but aren't sure how to get started. Go through all of your old stuff that you don't use anymore. Some people take an approach in which anything that (a) doesn't fit, (b) hasn't been used in six months, or (c) no longer brings you happiness should be eliminated from your life. Clear out the physical clutter, donate it to an organization or individual that will repurpose it, and help someone else out in the process. You may want to include a blessing of donations ritual as well. As the calendar year draws to a close, this is also a good time to start planning ahead. Think about what changes you're going to want to make in the coming months. You know all those New Year's resolutions you always make? Put some planning and forethought into them this time around, and you'll be far more likely to keep them. Get ready to break your bad habits, and start forming some good ones, to become a new and improved version of yourself in the new year.